I finally bought a new blender! After A LOT of debate, I splurged on a Vitamix Blender. I can’t even begin to list all the brands and models that I studied and deliberated over. In the end it was a battle between price and quality (as usual) and in this case the price was worth it. I christened it with… what else… a coffee beverage, a double Cafe Frappe for me and my sister. (We do love our coffee!) Then I made this healthy smoothie for lunch. I know what you might be thinking. Blueberries and basil together? I know! But it works. 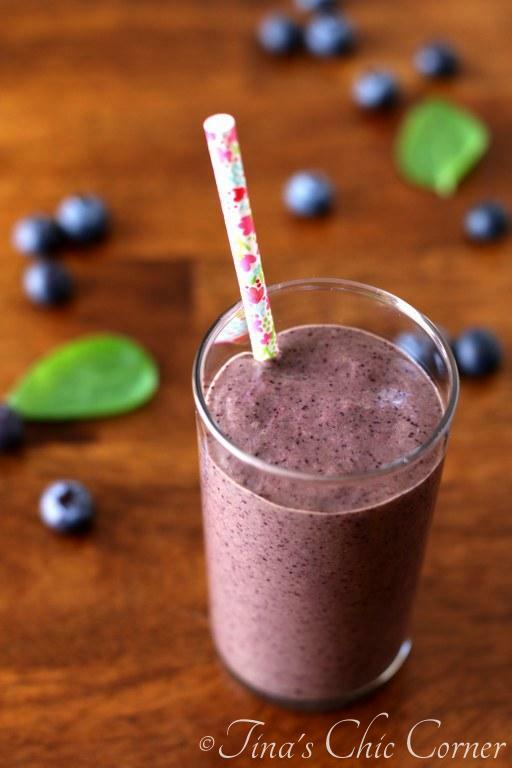 This tasty fruit and veggie smoothie is packed with loads of vitamins and nutrients. In a blender, combine all of the ingredients and blend them until they are smooth and creamy. I have been wanting a Vitamix for years. I’d pretty much watch it on QVC every time it comes on (and my husband can attest to that because he’s watched some of them with me). I hesitated partially because because it’s super expensive for a blender and partially because I didn’t want to post recipes that are exclusive to Vitamix owners. (Yet, I posted a doughnut recipe not knowing if people had a doughnut pan. Go figure. 😉 ) You do not need a Vitamix blender to make this smoothie, but I would be lying if I said it doesn’t help. There are a few simple tricks to help a regular blender make a smoothie. You may need to run your blender for a longer period of time to properly beat everything up. Ice breaks all the rules of blending. As if by magic they survive almost unlimited amounts of time in a blender. In other words, if you simply rely on the fact that they float you may have better luck skimming them off than fully blending them. A little bit of liquid can help your blender process some of the more solid things you throw in it. If you aren’t having luck with something, sometimes a splash of a liquid that goes well with the flavors you are blending can help a lot. There is no mistaking that this smoothie is 100% healthy. It’s filling and I actually enjoyed this as a replacement for lunch. The combination of flavors in this smoothie are unique and they just simply work. It’s hard to explain, but I’ll try. The basil is a subtle flavor and it’ a nice compliment to the blueberries. (Seriously, I wasn’t sure that was going to work.) 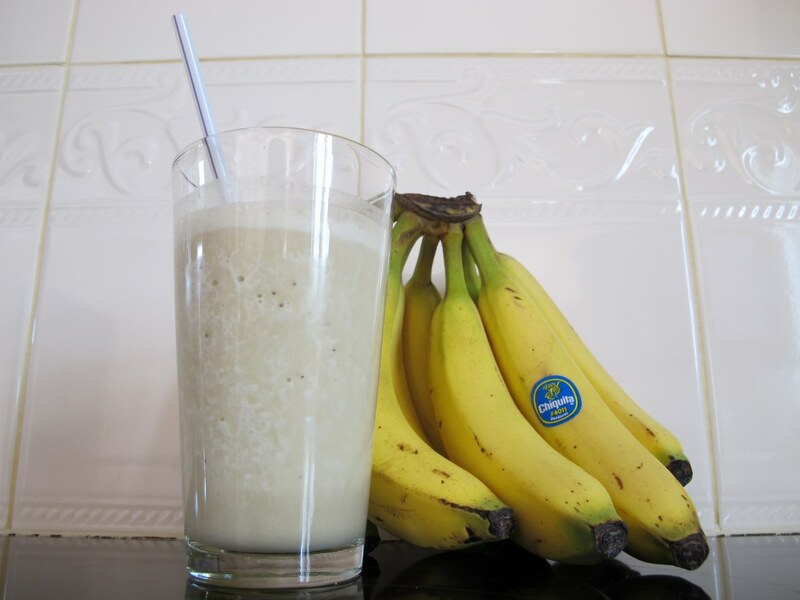 The frozen banana helps to give the smoothie a thick consistency, but you really don’t taste it. You know what else you don’t taste? The spinach. Honestly. My youngest sister tried this and she said that she would never have guessed it was in there. Since this contains basil and spinach does that make it a “green” smoothie even though it’s not green colored? Ignoring the proper definition of a green smoothie, and a little bit of color blindness notwithstanding, blueberries are a superfood so I’m totally counting this one. I want to thank all of you who gave me blender recommendations. I was super excited that people responded to my cry for help. 😉 You wouldn’t think that buying one would be so difficult. I’m loving my new Vitamix so far! Here are some other great healthy smoothies. Oh no! But I remember you got a new blender recently so I hope it’s been just as much fun for you. 🙂 Yay for smoothies! I love basil and berries, but I have never thought to combine them together! How creative! Now I have to make this because I can’t stop thinking about what they will taste like together! I would love this smoothie! It is so pretty too! I have a Vitamix too, it’s the best appliance I ever bought. Anyway, that’s an interesting smoothie combination, I’m going to have to try it out sometime. 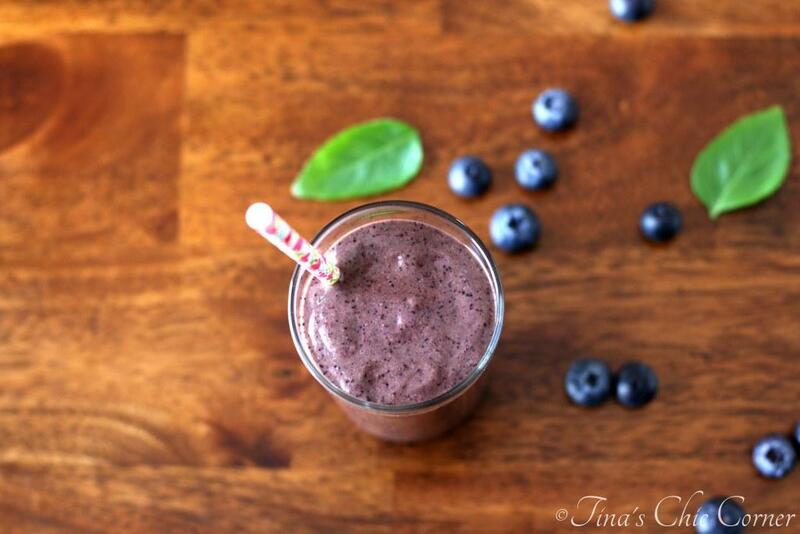 I love the idea of blueberry and basil together especially in a refreshing (& healthy) smoothie!! This looks great! I, too, have been debating whether or not to splurge on a Vitamix. I HATE my blender. It can’t do anything…I’m not going to name drop but it was expensive! Oh no, I’m so sorry to hear that you don’t like your blender. 🙁 I’ve only had the Vitamix for a week and so far it does exactly what I’ve seen it do QVC. It does have some serious power to it. I’m happy that I got it but I have to admit that it’s too early to tell if it was worth all the money (if that makes sense). This smoothie looks and sounds tasty! Congrats on the new mixer – I’ve always wanted a Vitamix! I expect to see tons more recipes like this from you :). I just wanted you to know, that I just nominated you for the Liebster Award because you are one of my favourite bloggers! 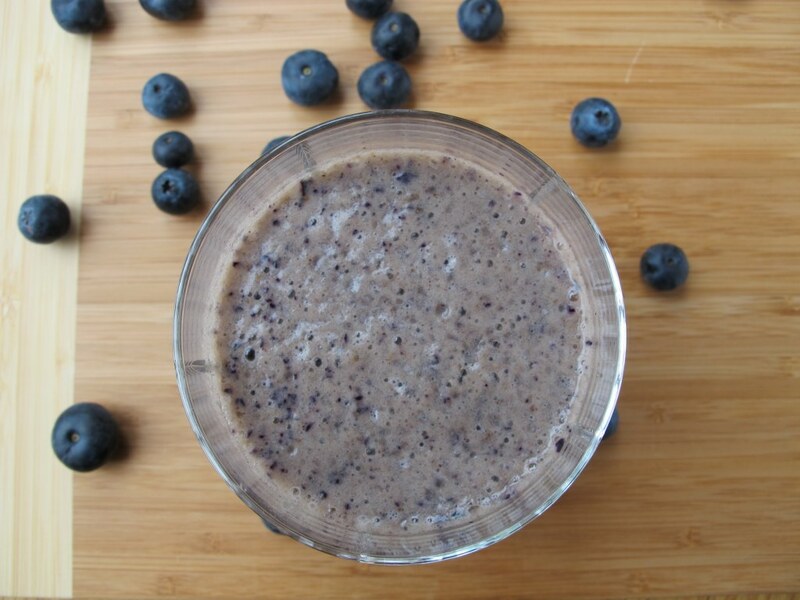 This really is a superfoods smoothie! I hear the girl in the flat upstairs making her smoothie early every morning and it’s been giving me a major case of ‘smoothie envy’. I think I need to give them a go. Love the idea of adding the basil … I can imagine that tastes amazing! I’ve wanted the Vitamix for a while. So glad you are loving it. This smoothie looks amazing! 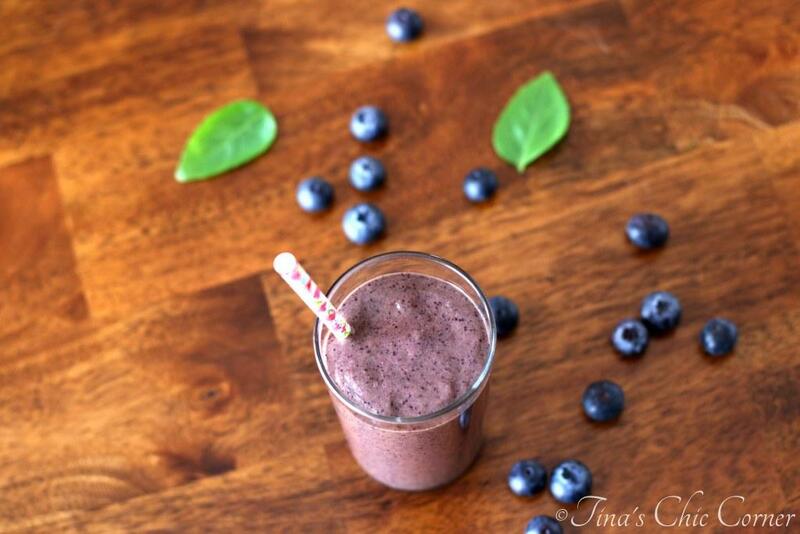 This smoothie looks like the perfect summer beverage! 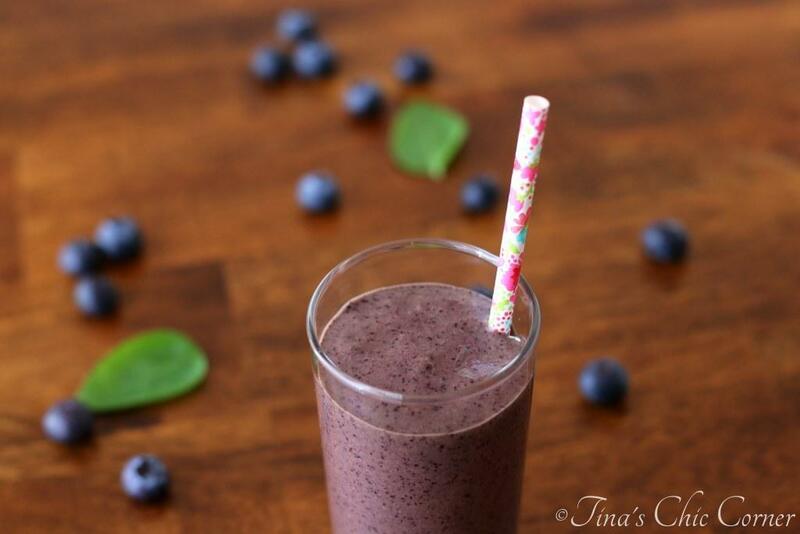 I’ve always loved the combo of strawberries and basil, so I’m sure I’d love this blueberry basil smoothie. The color in this is amazing! Yay on the new blender!! I love pairing herbs with fruit…this must make for such a fun smoothie! I keep looking at all my food to see what I can throw in the blender next. 😉 Love fun new kitchen tools! Can I just say that I am super jealous of your new blender?? : ) haha I want a new one so bad but am patiently waiting until my old one dies… silly thing is hanging on for dear life! And I am on a huge smoothie kick right now. I really need to try using basil in mine … it sounds like a perfect pairing with the blueberries! The flavor combo is unique, but that’s what I love about it. 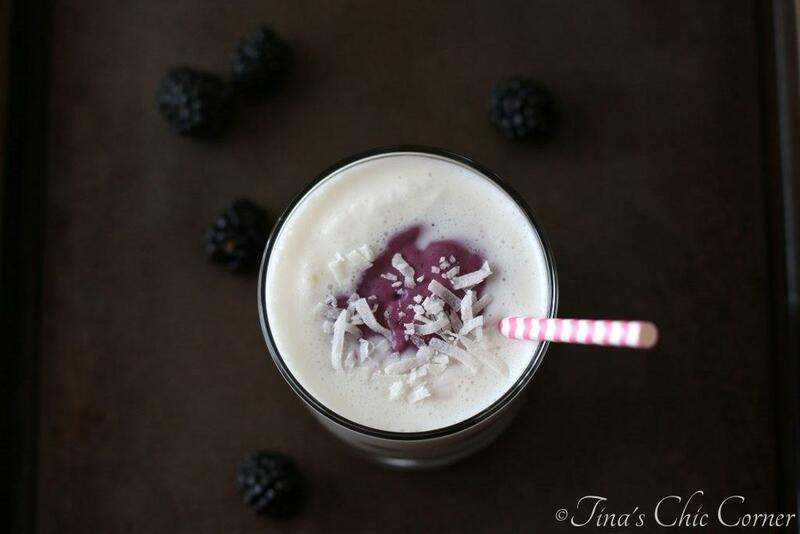 It’s something different than just the usual berry or citrus smoothie. Those are also great ones but you know how I’m always looking to switch it up. 🙂 Thanks for pinning! I’ve totally been eyeing the Vitamix blenders, Tina! I gotta save up for one, though. I keep finding things that I want to buy that have a little more sway than the blender does. But one day, one day I’m going to buy one! The addition of basil sounds amazing – I’ve been putting herbs into pretty much everything lately, but have yet to try it in a smoothie. Yours looks absolutely mouthwatering. Cannot wait to make this for breakfast tomorrow morning – I just happen to have everything on hand. It is meant to be!! Definitely worth the splurge! And Tina, I cannot get over how gorgeous these photos are. These are seriously some of the best smoothie photos I have ever seen! Blueberries are becoming staples in my diet again – basil is about to join the party! Basil + blueberries sounds like a super interesting combo that I need to try! Love the color of this beauty – it looks so fresh and healthy to me! You have really educated me on blenders, Tina! I have heard of Vitamix and Blendtec (in fact I’m sponsoring a Blendtec giveaway right now), but I had no idea why they were so expensive or fancy. All I have is a stick blender, and that has served me fine to make smoothies. Now I understand what all the hubbub is about! I didn’t know that even a regular blender could have trouble making a smoothie (with ice). Now you’ve got me thinking I need a fancy blender and a bunch of frozen fruit. And some straws. This looks amazing, and I think I’ll include it in a superfood roundup next week if that’s OK. Thanks (and sorry this is so long)! I always love seeing your comments, Andi. 🙂 I’d be honored for you to include this smoothie in your superfood roundup! I definitely learned a lot about blenders lately, that’s for sure, and it was fun sharing my shopping and purchase adventures with everyone.